See also Asian gardens design and history overview - Sacred Gardens. See chart of Asian garden styles (including Hindu enclosures). 'Hindu’ describes the civilization and religion of the Indus valley. 'India' and 'Hindu' derive from 'Indus'. Linguistic analysis identifies its origin as Indo-European (Aryan). Hinduism is not an organized religion, like Christianity or Islam. It is more a set of beliefs and a way of life centered on a set of sacred texts (including the Bhagavad Gita, Rig Veda and the Upanishadas). Hinduism is also a nature-loving faith. There are references to gardens in Hindu literature, including tanks, lotus-shaped baths and lakes, creeper pavilions and tanks. 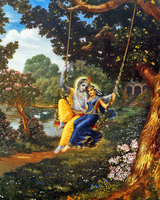 Stories about Krishna appear to be set in a garden context, as when he stole the clothes of the gopis (cowgirls) when they were bathing and when he enjoyed being on a swing with Radha. 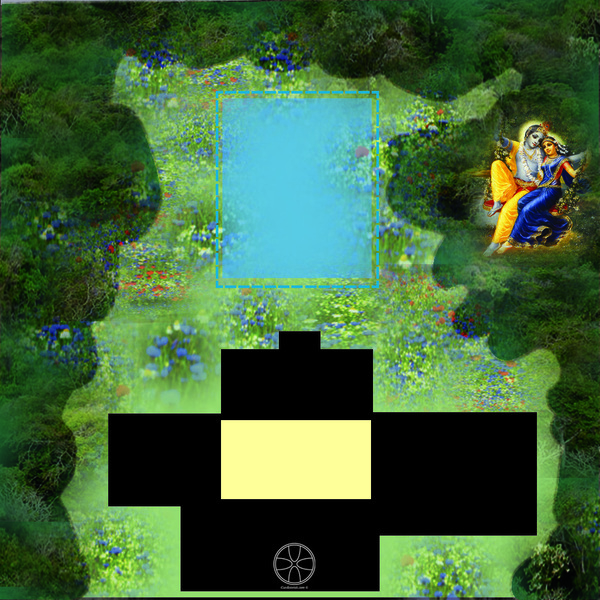 The diagrams, right, represent (1) a Hindu garden with a courtyard palace, flowery grove, lotus pool (2) a Hindu temple at the confluence of two rivers. The diagrams from Tom Turner Asian gardens: beliefs, history and design (Routledge, 2011) Several Old Books (Puranas) describe the Creator God (Brahma) as emerging from a lotus in the navel of Lord Vishnu. See note on the Vastu Shastra Mandala. Garden pools, in woodland, grassland and rock, are a possible origin of the stepwells ( baoli or baori) which became such a notable characteristic of Indian settlements. See also: Hindu temples site planning in landscapes. And see note on fruit and flowers in Hindu and Mughal charbagh gardens. Harappan civilization flourished in the Indus valley c2000 BCE (eg at Mohenjo-daro and Harappa). They built in stone but little is known of their beliefs. Early Buddhist buildings was made of wood and later of stone. It is not known whether these buildings were influenced by Persia and Mesopotamia but Buddhism certainly influenced construction of the oldest Hindu temples (after c100 CE). In Hinduism, the earth itself is worshiped as the mother goddess Devi (the name means 'goddess'). She is incarnate in rivers which give fertility to the soil. Garlands thrown in the water honour her. The other two great gods in the Hindu trinity are Shiva ('the destroyer') and Vishnu ('the creator'). Each has many avatars and temples were built as places to honour and worship gods, with the guidance of Brahmins. Kauṭilya (also known as Vishnugupta and Chanakya) was an advisor to King Chandragupta Maurya (r 321 – 297 BCE) who unified north and south west India into a single state. His treatise on government states that ‘In areas lacking water,he should construct wells, reservoirs, and springs, as well as flower gardens and fruit orchards’ (Penguin edn., translation by L.N Rangarajan). Cities were planned for security. 'Demarcation of the ground inside the fort shall be made first by opening three royal roads from west to east and three from south to north. 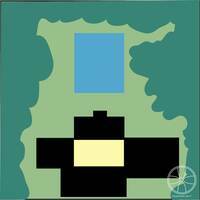 The fort shall contain twelve gates, provided with both a land and water-way kept secret. Chariot-roads, royal roads, and roads leading to drónamukha, stháníya, country parts, and pasture grounds shall each be four dandas (24 ft.) in width. Roads leading to sayóníya, military stations (vyúha), burial or cremation grounds, and to villages shall be eight dandas in width. Roads to gardens, groves, and forests shall be four dandas. Roads leading to elephant forests shall be two dandas. Roads for chariots shall be five aratnis (7½ ft.). Roads for cattle shall measure four aratnis; and roads for minor quadrupeds and men two aratnis. Royal buildings shall be constructed on strong grounds. In the midst of the houses of the people of all the four castes and to the north from the centre of the ground inside the fort, the king’s palace, facing either the north or the east shall, as described elsewhere, be constructed occupying one-ninth of the whole site inside the fort. Royal teachers, priests, sacrificial place, water-reservoir and ministers shall occupy sites east by north to the palace. Royal kitchen, elephant stables, and the store-house shall be situated on sites east by south. On the eastern side, merchants trading in scents, garlands, grains, and liquids, together with expert artisans and the people of Kshatriya caste shall have their habitations.' (translation by R. Shamasastry). See Sisupalgarh Ancient City. 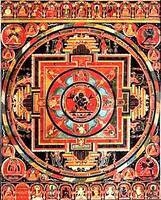 A mandala is a 2-dimensional representation of the cosmos with the god and his palace at the centre. Hindu temples are 3-dimensional mandalas. They are rectangular enclosures with a sanctuary at the centre, a tall structure to represent Mount Meru (the centre of the universe). In her study of The Hindu Temple (1946) Stella Kramrisch noted that 'The gods always play where groves are near rivers, mountains and springs, and in towns with pleasure gardens'. Temples are therefore sited in relation to rivers and groves. They are places of pilgrimage, not places of congretational worship. Though associated with Buddhism, the mandala idea is Hindu in origin. Nelson Wu, in Chinese and Indian Architecture: the City of Man, the Mountain of God and the Realm of the Immortals, 1963) sees the circle as a symbol of Indian civilization. He contrasts the 'Indian world of holy places' [the Mountain of God] with the square as a symbol of Chinese civilization [the 'Chinese world of walled cities' - the City of Man]. Buddhist and Hindu design ideas grew together. Sadly, there is little visual evidence for the design and character of gardens in ancient India. 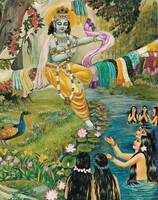 There however a number of textual references to gardens in the Ramayana and other old books. The trees both fruit and blossom bore. E'en with the home of Gods on high.